Planning your fall/winter holiday travel in California or Oregon? If so, then Greystone Hotels, a California based hotel ownership group, has a number of boutique west coast hotels for you and your dog to choose from. As we’ve mentioned before, hospitality companies are another great source for pet friendly hotels. And while they don’t have a single brand name for all their hotels, they often have great perks for pets that are common to all or most of them. 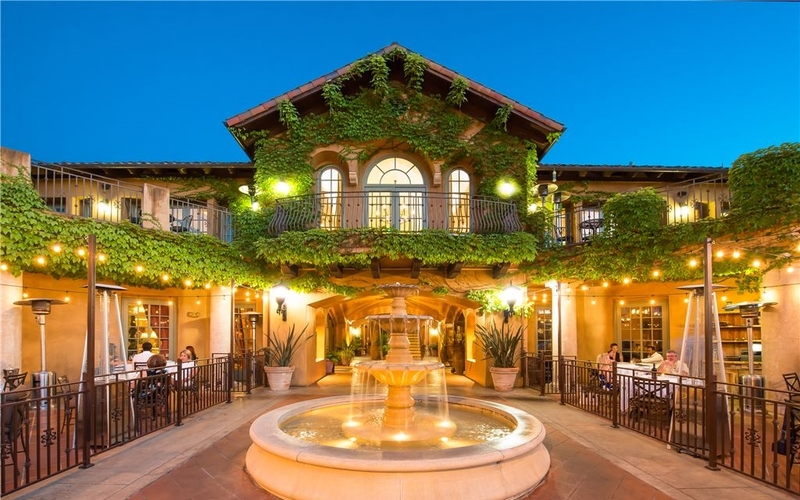 With four independent boutique properties and one Marriott hotel, Greystone’s five properties are more than just pet friendly, they each offer unique experiences, comfort and service in some of the West’s most popular locations. Garden patio at the Empress Hotel. Empress Hotel, La Jolla, CA: With miles of Pacific Coast to wander, there’s lots to do with your pet in La Jolla including hiking to Seal Rock, the La Jolla Tide Pools, or hanging out at Cuvier Park. Their Pampered Pooch Package includes a doggie bed as well as food and water bowls. They also provide a bag of milkbones, daily 30-minute walks by Rover.com, a Muttropolis gift card and a Green Paw self-service dog wash. They charge a $75 fee per stay for 2 pets up to 60 lbs. Pets can stay unattended if a mobile phone number is provided. 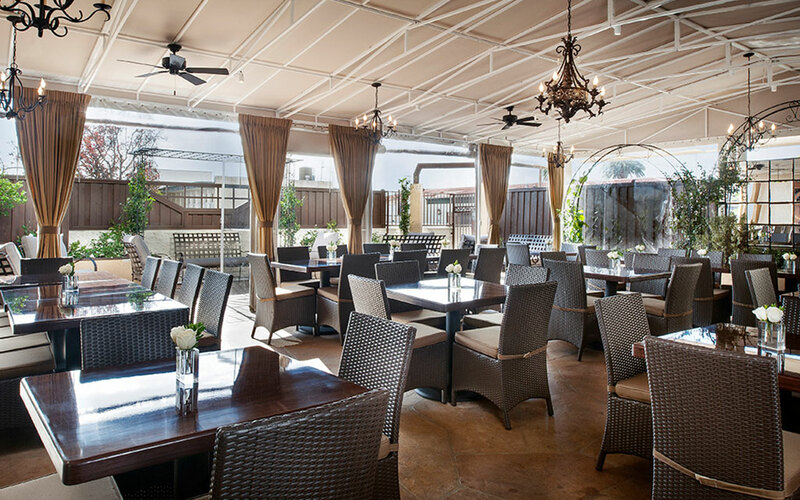 Hotel Los Gatos, Los Gatos, CA: Located in the foot hills of the Santa Cruz Mountains and within driving distance to Silicon Valley, the Santa Cruz coast and Northern California wineries, there’s plenty to keep you and your favorite animal occupied in Los Gatos. You can also head for Vasona Park, a 45-acre pet friendly park which gives you access to the Los Gatos multiple use trail which runs 9 ½ miles through the town of Los Gatos, Los Gatos Creek Park, and the cities of Campbell and San Jose. The hotel charges a pet fee of $50 per night for dogs up to 75 lbs. 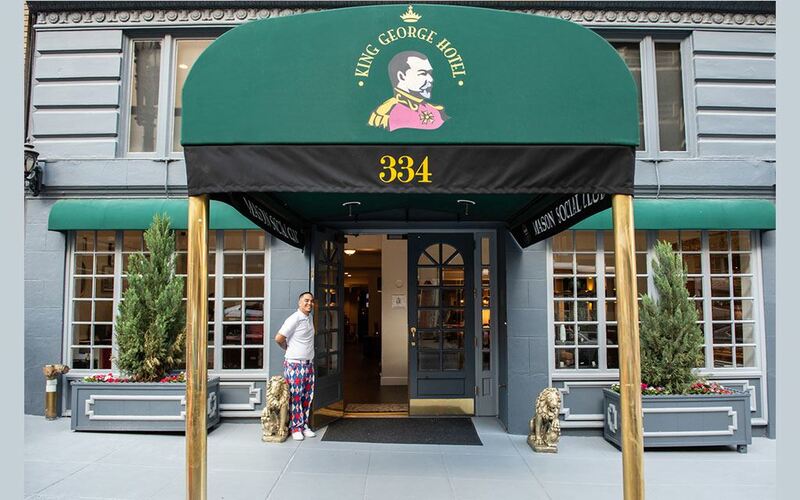 King George Hotel, San Francisco, CA: Situated in downtown San Francisco, just one block from Union Square, you have immediate access to great shopping, boutiques, art galleries, cafes, as well the Theater District. The King George has a PAWsome HosPETality package which includes a plush toy bone, peanut butter and apple treats, two bottles of water, a doggie bed, feeding bowls and mats, and two pet waste bags. You also visit Fido’s Market Place which is located at the reception desk where you can purchase essentials for your pet, including dog leashes, and more treats. There is a one-time pet fee of $50 per stay with a maximum pet size of 45 lbs. Lobby of the Bristol Hotel. 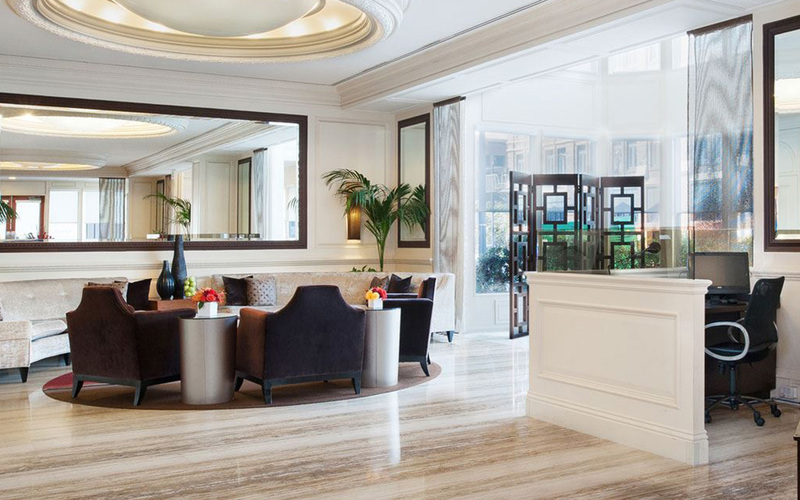 Bristol Hotel, San Diego, CA: Just walking distance from the San Diego Waterfront and the Gaslamp quarter, the Bristol Hotel is centrally located to make sure that you and your pet will not lack for things to do. Their “Who Let the Dogs In” pet package will also guarantee you won’t lack any pet amenities. The package includes overnight accommodations in their Superior Series guest rooms, a welcome treat for your pet, a pet bowl, pet bed, and nightly turndown service for you and your favorite animal. The Bristol charges a $25 per day pet fee for up to two pets with no size restrictions. Pool area of the Towneplace Suites, Bend, OR. 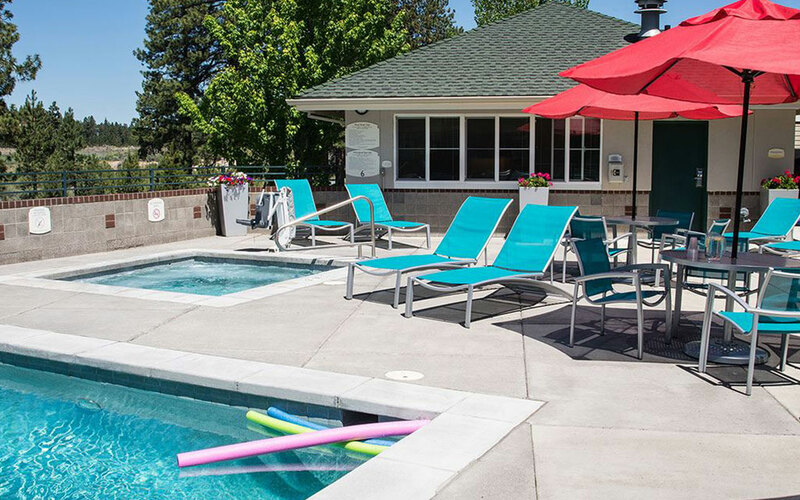 TownePlace Suites, Bend, OR: Surrounded by the peaks of the Cascade Mountains and the Deschutes River, Bend is a great place to visit with your pets. Walking distance to parks and trails and near the base of Mt. Bachelor, you can plan a day of hiking or fly fishing on the river. The hotel provides treats, feeding bowls, a toy and waste bags. There is a pet fee of $25 per day up to a maximum of $100. All well-mannered dogs, cats, birds or fish are welcome.